Sonia Kashuk Chic Luminosity Bronzer/Blush Duo in "Glisten"
While stocking up on some of my "holy-grail" products at Target, I spotted this lovely cheek duo on the shelves and immediately snatched it up to take home with me. I thought that it would be a wonderful summery product to bring to my recent cruise to the Bahamas. 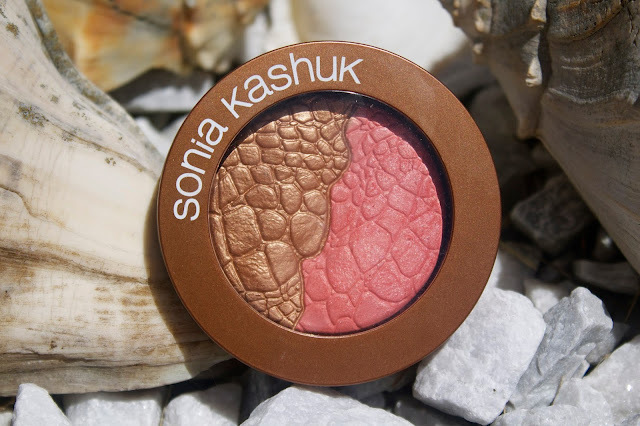 With summer coming to a swift close, the gorgeous shades in this Sonia Kashuk Bronzer/Blush Duo were the perfect bright pick-me-up. The cheek compact I chose was "Glisten"($12.99), a gorgeous duo featuring a mid-toned bronzer on the left and a blush on the right hand side. The packaging instantly won me over with its sophisticated rose-gold/brown exterior. 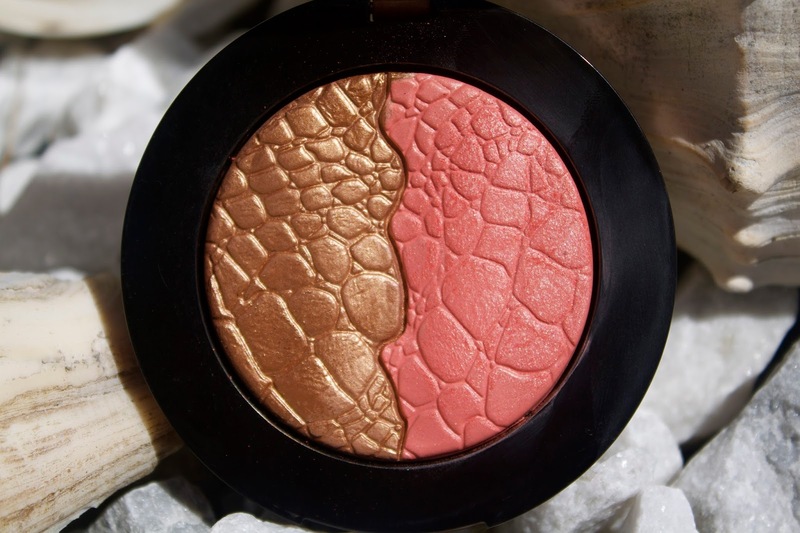 The stunning reptilian print etched into the powder made me day-dream of glistening dragon scales in the sunlight. The blush in this duo is a lovely coral tone that leans more towards the pink side. It applies quite sheer with one swipe but builds beautifully and easily when more layers are applied to the cheeks. The texture of the product itself feels wonderfully smooth and soft due to its "hybrid formula" that combines the best elements of "baked, powder, cream and fluid" products. It gives a healthy, radiant glow and has just a hint of a golden shimmer when reflecting in different lights. 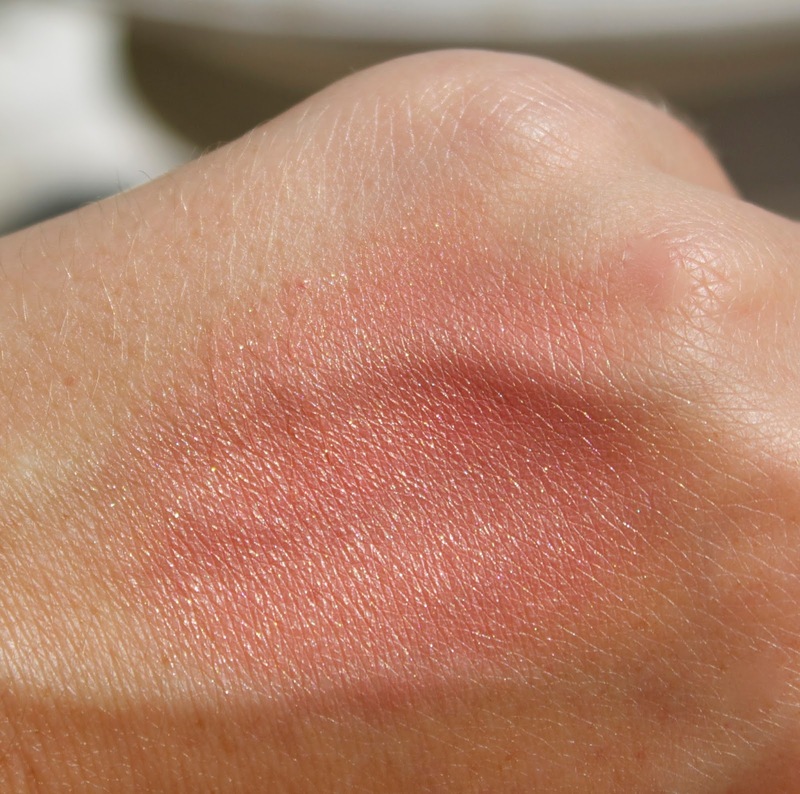 Once applied, both the blush and bronzer wear for quite a long time, but definitely not the 12 hours that it claims. I have found that the longevity is around 5 to 6 hours without fading or requiring a touch-up. 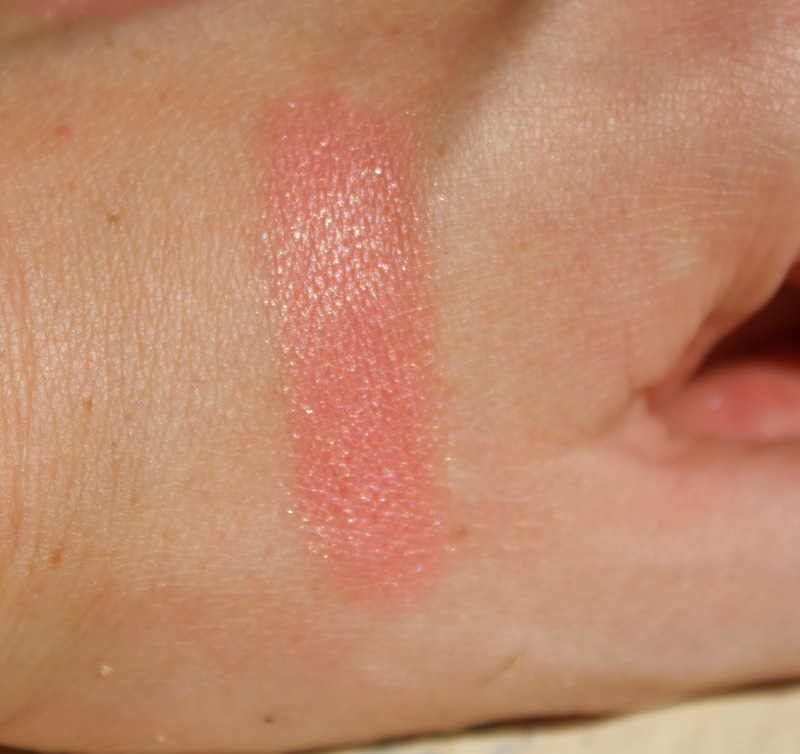 A blended out swatch of the blush color in the duo "Glisten"
A heavy, concentrated swatch of the blush color in the duo "Glisten"
The bronzer in this duo is a warm golden-brown color with a shimmery, almost metallic finish. I have been using it on the cheek bone area along with the blush to give a warm, bronzed glow to the face. Since the finish is so metallic, I wouldn't recommend using this product to contour the face as it might appear unnatural. Matte, finely milled powders such as NARS Laguna or NARS Casino are two great choices if you are looking for a powder contouring shade. 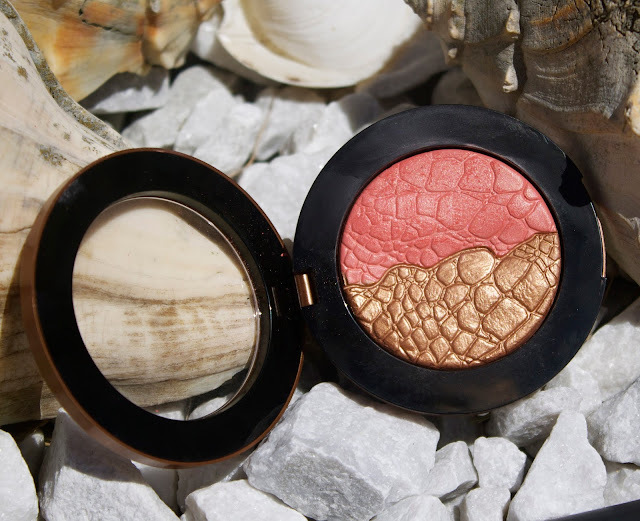 As baked products are safe to use around the eye area, I have even used this bronzer as an eyeshadow all over the lid. The color of this bronzer strongly reminds me of the golden/bronze shade "Half-Baked" from the Urban Decay Naked Palette. 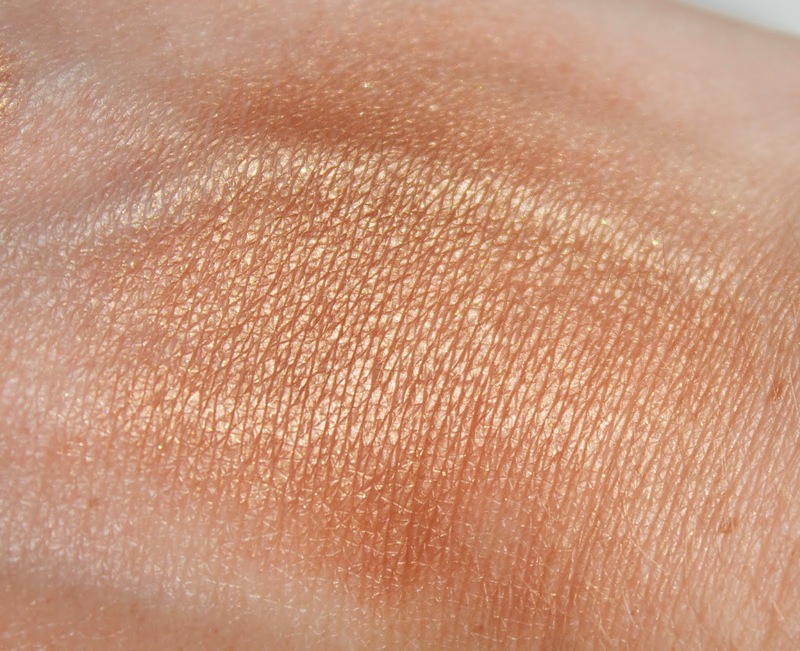 A blended out swatch of the bronzer color in the duo "Glisten"
A heavy, concentrated swatch of the bronzer color in the duo "Glisten"
Overall, I have been finding this compact very handy for traveling since its "two-in-one" advantage makes it a great space-saver. I also love that there is enough space to easily dip my brush into each separate product without mixing them together. Although not a "revolutionary" product, I have been enjoying wearing this duo for a youthful and bronzed summery glow.